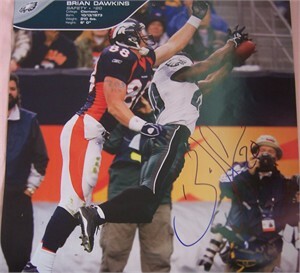 Philadelphia Eagles calendar page (about 12 by 12 inches) autographed in blue marker by former superstar safety Brian Dawkins. ONLY ONE AVAILABLE FOR SALE. With certificate of authenticity from AutographsForSale.com.